The 10th annual Classic Antique Power Farm Heritage Days takes place Friday and Saturday April 12th and 13th at Benson’s Chamber Park. Tractors will take to the streets in downtown Benson for a pair of parades. The first is planned for 11 a.m. Friday and the second will be 2 p.m. Saturday. Fans of antique tractors will have plenty to keep them occupied this weekend at Benson’s Chamber Park. The park, which annually plays host to Benson Mule Days, will come to life Friday and Saturday for the Classic Antique Power Farm Heritage Days. The event is an annual trip back to a simpler time in farming — a time when tractors did the majority of the “mechanical labor” often done today by complicated machinery. Visitors will be afforded demonstrations of everything from tobacco looping using collard greens to corn shucking, corn grinding and even the use of old-time washing machines. Demonstrations will be going on two or three times each day. For those who want to see the tractors they’ll spend the day admiring in action, there will be tractor games taking place both days as well. Mrs. Wood said events range from driver skill to the abilities of the tractors themselves. In addition, there will be vendors of all types on hand with everything from arts and crafts to food trucks and more. There’s also a swap meet going on both days, but the highlight as always will be the tractors. Both days will feature the Parade of Power through downtown Benson as well as bounce houses for the children, door prizes throughout both days and, added this year, a barnyard show. Mrs. Wood said several animals will make an appearance and will range from goats to baby rabbits to a miniature bull. There will also be goody bags for young and old alike. While the adults will receive bags with things such as cups, chip clips and key rings, younger guests will be given a backpack full of things like crayons. On Saturday, there will be a John Deere 4020 Pedal Tractor raffled off at 4 p.m. Tickets are $1 and will be available all day. The event runs both days from 8 a.m. to 5 p.m. and admission is $5 for adults and free for children 12 and younger. Friday features the Parade of Power at 11 a.m. with tractor games starting at 1 p.m. and demonstrations will begin around 2. Saturday’s events gets underway with opening ceremonies at 9:45 a.m. and will feature a Benson favorite. Saturday’s Parade of Power is scheduled for 2 p.m. with demonstrations at 3. 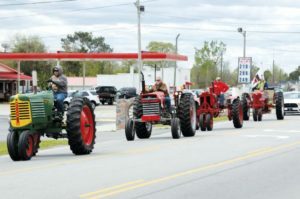 CAPTION: The 10th annual Classic Antique Power Farm Heritage Days takes place Friday and Saturday April 12th and 13th at Benson’s Chamber Park. Tractors will take to the streets in downtown Benson for a pair of parades. The first is planned for 11 a.m. Friday and the second will be 2 p.m. Saturday.